Our Paycheck Depends on Yours! 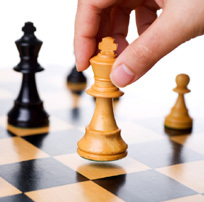 Checkmate ™ is designed to target elusive accounts that your sales teams are having difficulty closing. Clients retain IGI, bringing our resources and experience to bear on winning a specific account. Through a series of war room sessions, pre and post call analysis, and research specific to your targeted account, IGI and it's team will help you close that account in a timely manner - and our fees are directly related to your sales team's success. In addition, IGI teaches managers how to resource and staff to win specific opportunities more effectively and profitably. Research –IGI researches several components including current industry trends, the state of the potential customer in their segment, potential competitor offerings and influencers within the customer itself. Resource – how to not only build the team that is most likely to win, but IGI teaches organizations how to more effectively utilize the marketing, finance and operations infrastructure within their organization. Rehearse – multiple, live, war room designs created and implemented by IGI with scoring and feedback. On request, IGI will physically participate in critical sales presentations. Checkmate™ can be utilized alone or in conjunction with other programs.